(R-L)Parliamentarians Mrs. Tsering Lhamo, Mr. Tenzin Jamyang, and Ven. Khenpo Kada Ngodup Sonam at the press conference in Ranchi Media Hall. Ranchi, Jharkhand: 16th Tibetan Parliamentary Delegation comprising of parliamentarians Ven. 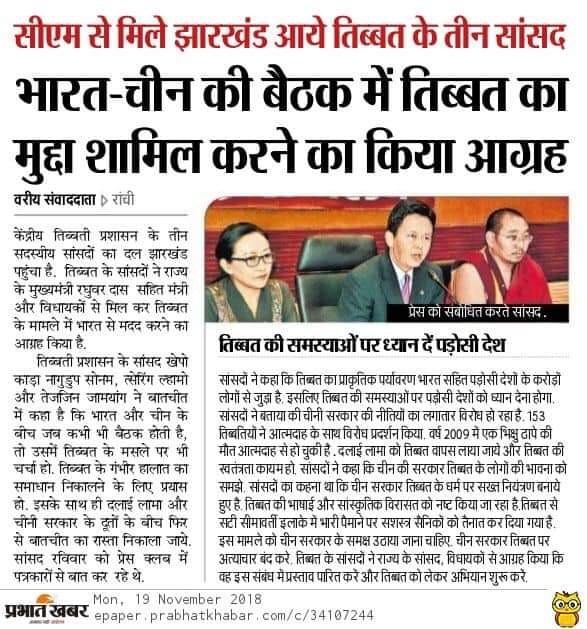 Khenpo Kada Ngodup Sonam, Mr. Tenzin Jamyang, and Mrs. Tsering Lhamo successfully concluded their 6 days campaign for Tibet Advocacy in Jharkhand from 13 to 18 November. The delegation called upon many high ranking leaders such as Chief Minister, Governor, Speaker and other state ministers. The delegation in the afternoon of 18 November, held a press conference at Ranchi’s Media hall highlighting Tibet Advocacy Program organised by Tibetan Parliament-in-Exile and Thank you India program initiated by Central Tibetan Administration to mark the 60 years in-exile and to thank the government and people of India. Around 15 reporters from Times of India, Hindustan Times, Kashish News, Jadeed Bharat, Taaza, Sanmark and Aaj news came to attend the press event. 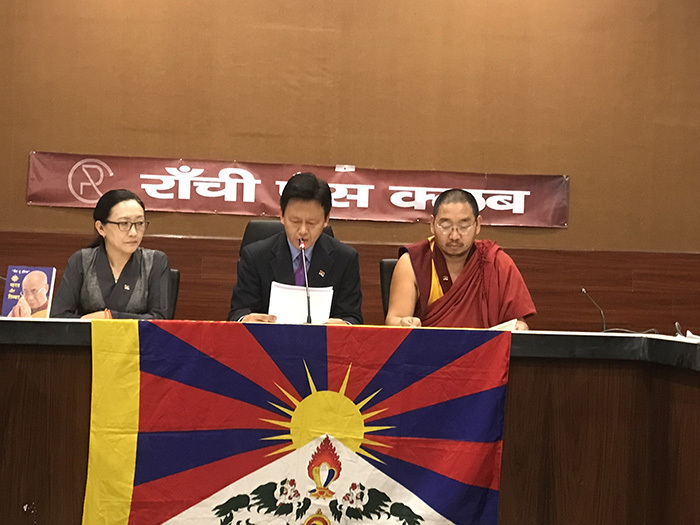 The reporters questioned about the demographic profile of Tibetans and Chinese population in Tibet, Tibet’s culture and religion, border relation’ between India and Tibet in the past and the present border issues between China and India, major rivers of Tibet, meetings with Jharkhand lawmakers and Tibetan sweater sellers. The delegation and media discussed on introduction of Buddhism in Tibet by Nalanda scholars and how the teachings of Nalanda spread across Tibet, demolition of residence in Larung Gar Buddhist Institute in Tibet, surveillance and monitoring of conversations in phone and social media by the communist government, mining in Tibet and its effect to the fragile environment of Tibet, usage of large amount of lithium in making phone batteries, International organisations response to the human right violation and environmental degradation in Tibet. The reporters showed a keen interest in Tibet cause. The delegation also distributed publications of Tibetan Parliament-in-Exile to the Medias. With the successful conclusion of the advocacy program in Jharkhand, the delegation left for Delhi. Snippet of the Tibetan parliamentary delegation’s Tibet advocacy campaign as published in a local newspaper, Ranchi.